This morning, Ambassador H.E. 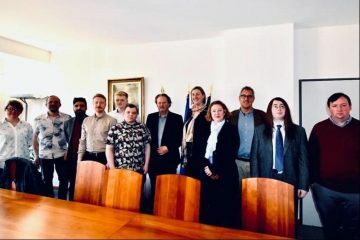 Orla Tunney welcomed Dr Denis Murray BA, MBS, PhD, Deputy Principal, Sergio Calabria, Games Design Lecturer, and Visual Media degree students from Ballyfermot College of Further Education (BCFE) at the Embassy of Ireland Lisbon. Also present was Miguel Fontoura, Lead Developer at Collide : Videogames and Digital Storytelling, who are hosting the BCFE students for a couple of weeks as part of the Erasmus Plus programme. The Ireland Portuguese Business Network secured the placement of the students from BCFE at the leading Portuguese and International Game Developer company Collide. This is the first such cooperation between the Education and the IPBN of many more to come. Special thank you from the IPBN to Tiago Loureiro and Miguel Fontoura from Collide to make that experience possible.